Memorial Day became a federal holiday in 1971, and many people use the “day off” to visit cemeteries to honor those veterans who have fallen. While also celebrating the unofficial kick-off to the summer season, we also use the holiday to revere our family members or friends who died serving the United States while active in the military. “When the flag is in such condition that it is no longer a fitting emblem, it should be destroyed in a dignified and ceremonious fashion, preferably by burning,” the code states. Phaneuf Funeral Homes and Crematorium offers complimentary flag retirement and has received more than 500 flags in the past year. Decommissioned or tattered flags can be deposited in the flag mailbox located at 243 Hanover Street, Manchester, NH. We utilize our crematorium to burn these flags respectfully. When the flag is displayed otherwise than by being flown from a staff, it should be displayed flat, whether indoors or out or so suspended that its folds fall as freely as though the flag were staffed. When displayed from a staff in a church or auditorium, the flag should occupy the position of honor and be placed at the speaker’s right as he [or she] faces the audience. When flown at half-staff, the flag should be first hoisted to the peak for an instant and then lowered to half-staff position. It should again be raised to the peak before it is lowered for the day. While the flag is traditionally draped over the casket during a veteran’s funeral service, in the case of a veteran’s cremation, the flag is hung over the urn or receptacle, before the flag-folding ceremony. The flag-folding ceremony at a funeral service is a very impactful way to commemorate the life of a veteran or fallen soldier. During the flag-folding ceremony, the flag is carefully folded a total of 13 times by six honor guards. 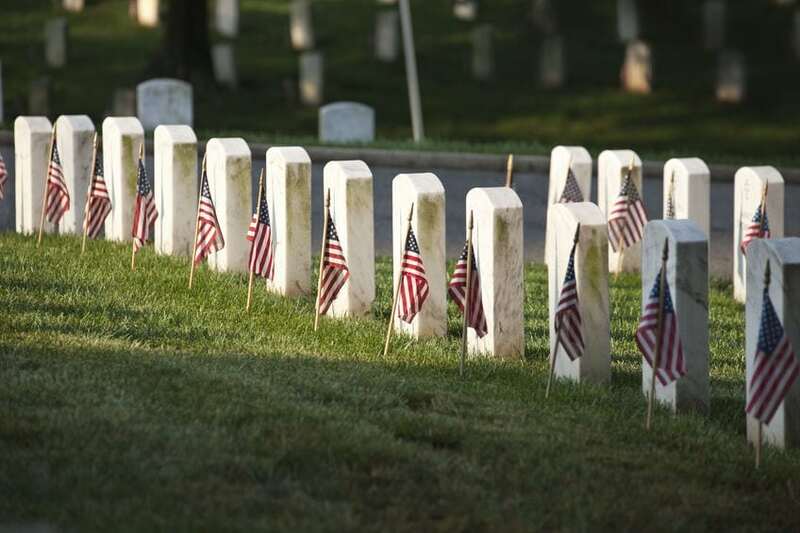 Memorial Day is often a somber time of reflection, taking our thoughts to mortality, possibly reminding us of the traditions observed at a military funeral. Phaneuf Funeral Homes and Crematorium ensures those who served are treated with the utmost respect. There are several veterans funeral benefits and recognition markers that veterans may be eligible to receive as part of a funeral service. For example, the NH State Veterans Cemetery in Boscawen provides free burial space for veterans. Veterans may pre-apply to confirm eligibility.